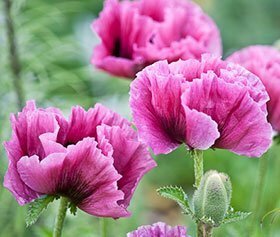 Oriental poppies belong to that group of perennials whose leaves go through a disappearing act in mid-season. But the dazzling, heart-stopping beauty of their flowers – which seem to glow from within and dance in the breeze – is worth the effort of concealing foliage that turns yellow and disappears in mid-summer. Depending on cultivar, the flower petals resemble smooth, shimmering silk or pleated crepe paper. The edges may be ruffled, pinked or crinkled and some flowers may have a black blotch at the base. 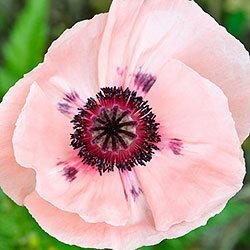 The oriental type (Papaver orientale) is the largest and only true herbaceous perennial poppy grown in North American gardens. Other members of the poppy family include self-seeding but short-lived Flanders, Shirley, Iceland, California and Alpine poppies. Oriental poppies have large (4 to 7 inch wide), showy flowers, and they thrive in areas with reliable winter frost. Like other long-lived perennials, the plants can persist for decades. In spring, coarse, thistle-like leaves emerge from the crown, followed in a few short weeks by two to four foot tall, depending on cultivar, hairy flower stalks with large nodding buds. And then come the flowers – gorgeous, gleaming saucer-sized blooms in colors and bicolors that range from brilliant shades of scarlet, orange and white, through soft and bright shades of rose, pink, lavender and salmon, to dusky plum and claret reds. Oriental poppies are easy to grow in USDA zones 3 to 7, requiring only good drainage and full sun in the north zones, and afternoon shade in southern zones. They are fairly drought tolerant, as they go dormant for about half the season, and they are deer-resistant. Each flower lasts only a couple of days and the bloom season is short, about one to three weeks depending on heat and storms, and then the foliage goes summer dormant. When oriental poppy leaves turn yellow and wither, you should leave them in place until mid-summer when it is safe to cut them to the ground. Fresh leaves pop up in late summer, but have little impact in the garden. Thoughtful placement of poppies in the middle or back of the bed, and careful positioning of larger billowing perennials such as hardy geraniums, asters, Russian sage (Perovskia), or Baby’s breath (Gypsophila) will cover the demise of the poppy foliage, but still allow their floral show to be admired. After the petals fall, the seed pods that develop are very decorative, but you should remove them before they fully ripen and turn brown to avoid seedlings that may revert to orange flowers. Root cuttings are a simple method of propagation and are best made early in the spring or right after flowering. Carefully dig plants to expose the gnarly, brittle roots and cut 3-4 inch sections of root. Then plant the cuttings in well prepared soil and cover lightly. Use a horizontal cut at the top of the root and a slanted cut at the bottom to help you orient the roots correctly when planting. You can divide oriental poppies while they are summer dormant. Plan your poppy color scheme carefully. The roots are brittle and bits are always left behind when plants are dug, so that same color is likely to grow again in the same place for several seasons. Breeding and selection are responsible for the ever increasing range of Oriental poppy flower colors. A German breeding program of particular note has produced the Von Zeppelin poppies – a wide range of vivid flower colors on compact plants with high flower count and a relatively long blooming season. Below is a small selection of named cultivars listed by flower color, but it is only the tip of the iceberg. Dozens of cultivars exist that will bring dazzling sparkle to the late spring garden. Bicolor: ‘Pinacle’- red and white, ‘China Boy’ – orange with white center, ‘Maiden’s Blush’ – white with soft pink edge.